HYDE PARK — The revival of the block-long Rosenwald Apartments is close to beginning 15 years after the last residents moved out. In the final two weeks of 2014, the city issued the first building permits to allow work to start on a $109 million plan to revive the former home of Nat “King” Cole, Quincy Jones and Gwendolyn Brooks. “It has been a long time in the making,” said Ald. Pat Dowell (3rd). According to Dowell, Landwhite Developers will start demolition work in the next month and construction will begin in earnest in the spring. 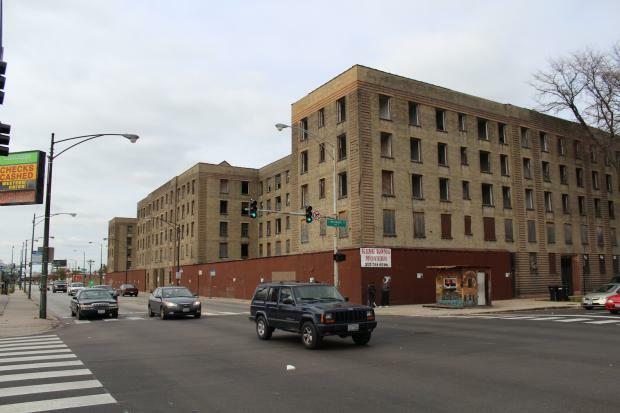 Landwhite’s plan is to completely redo the interior of the 85-year-old building that dominates an entire city block at 4600 S. Michigan Ave. as 235 apartments for seniors and working families. A representative from Landwhite did not return calls for comment. According to Dowell, the developers have also closed on financing for the project. “My attention now will be focused on property management,” Dowell said. She said she is trying to find a local property management company to partner with Mercy Housing, a national property management nonprofit based in Denver, Colo. The majority of the building will be one- and two-bedroom apartments. Seniors will occupy 138 units, of which 60 will be Chicago Housing Authority units, 60 will be rent-assisted and 18 will be affordable units where the rent is kept below a threshold based on the average income of the neighborhood. Families will live in the other 97 units, of which 84 will be affordable and 13 will be market-rate. The project is heavily backed by the city, which is putting up $84 million in tax subsidies, grants and interest-free loans. The Chicago Housing Authority is also contributing $17.4 million to the project. Dowell said she thought the building would also start to see more interest for the 75,000 square feet of office and retail space once construction begins. “We’re starting to get some nibbles and bites, but there are no leases signed,” Dowell said. The project also includes a two-acre interior courtyard and other amenities. Rents are projected to be between $450 and $800 for a one-bedroom apartment and between $450 and $850 for a two-bedroom apartment.